I promised that I would let you all know about major changes coming to the website, so here is the first! I recently hired a filmmaker to follow me around for the day in order to make up a few showreels. We also filmed 5 tutorial video clips. You can find them all on the appropriate tricks and products pages throughout the site, as well as on my Video Clips Page. I would really appreciate your feedback regarding these clips. Many people have wrote to me over the past couple of years asking me to add video clips and I am glad I have finally got round to it! If the clips are successful, then I can look into creating more tutorials, so put in your requests now! Back in March, when I launched the Bargain Basement Section and announced it in my last newsletter, it proved a hit, and this week, I further reduced another 55 items. Some items are reduced well below cost price as I am trying to phase out certain items before my move to England, so everything must go! New Products in the past few months include a Flying Pig and Flying Monkey (they work just like a catapult and can travel a surprisingly long distance through the air while making the appropriate oink and screech sounds!) 5 Klutz Books now available (Footbag, Juggling, Bubble, Facepainting and Book of Immaturity). The Prisms evolution kit is available for Babache Finesse Diabolos. Those clever people at Babache have now created the Wind Juggling Ring, which is easier to juggle outdoors, as it has little circles all around the rim, to aid the flow of air through the ring… amazing stuff! All available in my online store (UK only). Just click the SHOP button at the top of any page on this website. My wife started work in a village called Rushden in Northamptonshire 6 weeks ago. 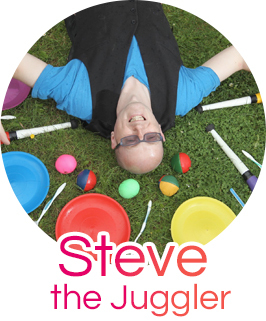 I finish all my juggling commitments here in Scotland on 31 August and am available to move as soon as we sell our house, at which point we will buy a house in or around Rushden. I am currently preparing promotional packs for schools, children’s organisations (brownies/scouts etc) and Churches throughout the East Midlands (but willing to consider further afield also), so if you would like one sent out, please get in touch. In the meantime, more details about all the different types of performances and workshops I run, can be found in the performances section of my website! To help highlight my glow juggling entertainment. 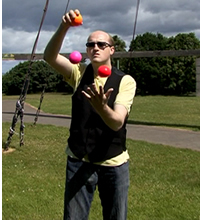 This page was launched today to accompany my glow juggling showreel. Glow is a much safer alternative to fire juggling and therefore suitable for both indoor and outdoor events.